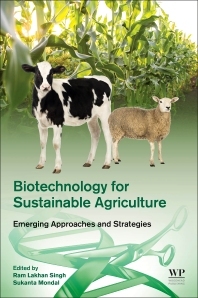 Biotechnology for Sustainable Agriculture: Emerging Approaches and Strategies is an outstanding collection of current research that integrates basic and advanced concepts of agricultural biotechnology with future development prospects. Using biotechnology with sustainable agriculture effectively contributes to gains in agricultural productivity, enhanced food security, reduced poverty and malnutrition, and more ecologically sustainable means of food production. Written by a panel of experts, this book is unique in its coverage of the broad area of biotechnology for sustainable agriculture. It includes intriguing topics and discussions of areas such as recombinant DNA technology and genetic engineering. 3. Biotechnological tools to enhance sustainable production. 7. Microbial biotechnology and sustainable agriculture. Dr. Sukanta Mondal (h-7) is currently working as Principal Scientist, Physiology Division, National Institute of Animal Nutrition and Physiology, Bangalore, India. He received his Ph.D. from Indian veterinary Research Institute, Bareilly in 2006 on his work on molecular characterization of prostaglandin synthase genes in buffalo. He joined National Institute of Animal Nutrition and Physiology, Bangalore in 1997 as Scientist. He became Senior Scientist in 2006 and Principal Scientist in 2012. His major research interests involve cloning, characterization and expression of genes regulating early embryonic loss, molecular characterization and expression of hormone receptors, impact of stress on maternal recognition of pregnancy etc. He is a noted environmental physiologist who has deciphered the molecular basis of climate change impact on maternal recognition of pregnancy and embryo survival in sheep. He was instrumental in developing ideal heat stress and nutritional model in sheep. He has published over 130 research publications in various National/International journals and presented more than 20 papers at various National/International Conferences. He has delivered invited lectures in different conference throughout the country and abroad. Dr. Mondal’s pioneering and path breaking contribution in hormone receptor as well as sheep and buffalo genomics has been recognized nationally and has received several prestigious awards like Prof. G. P. Talwar Midcareer Scientist award (2014), Rashtriya Gaurav award (2014), Prof. G. K. Pal award (2013), Fellow of Indian Chemical Society (2013), Fellow of Society for Applied Biotechnology (2012), Fellow of Indian Association of BioMedical Scientitsts (2010), Dr. K. Anji Reddy award (2011), Prof. P. B. Sen Memorial Oration award (2008), Biotechnology Overseas Associateship award (Long term, 2007-08), ISSRF Young Scientist Award (2006), 2000 Outstanding Scientists of the 21st Century and 21st Century Award by the International Biographical Centre, England, UK as well as ABI’s Research Board of Advisors by American Biographical Institute, Inc, USA. Dr. Mondal has been bestowed with several fellowships including National Scholarship (Govt. of India), S J Jindal Trust fellowship, Junior Research Fellowship (NDRI), Senior Research Fellowship (IVRI) and CRBR Postdoctoral fellowship (Canada). He is serving as Joint Secretary, National Environmental Science Academy, Executive member, Physiological Society of India and Editorial board member of Indian Association for Animal Production. He is Associate Editor of journals viz., American Journal of Biochemistry and Molecular Biology, Asian Journal of Biotechnology, Asian Journal of Cell Biology, Current Research in Poultry Science and Biotechnology etc.